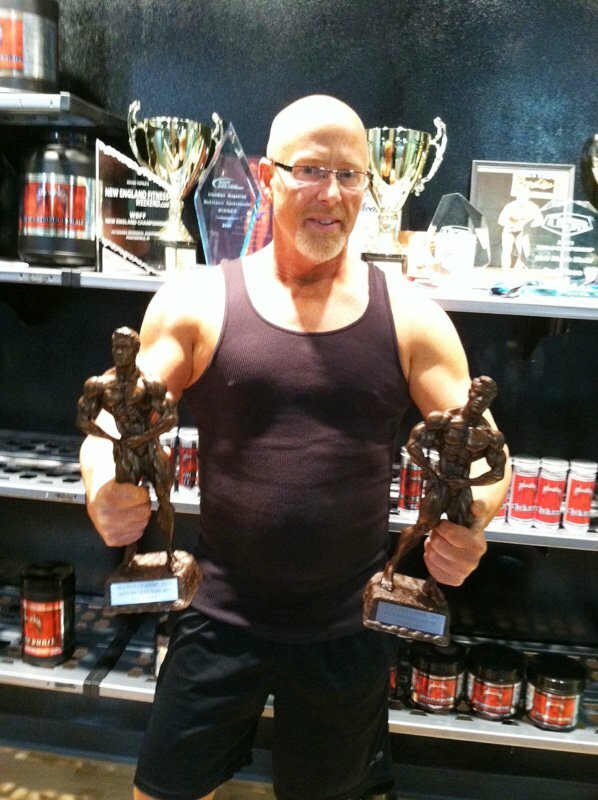 In Fitness, Greg found relief from his aging body and cut out on a new life toward healthy living. See how he shed 28% body fat! I was already in a high risk group due to my genes and the lifestyle I had gotten used to up to that point. Learning in your 30's that you have high blood pressure and you need to start meds is definitely a wakeup call! In addition several years ago, almost 8 I'd say, I was trending towards being diagnosed with Type II Diabetes. Though I was a bit ove weight, in no way was it excessive. Rather it was a combination of genes and yes, my poor diet and lack of consistent exercise. What happens when you go for a time being good? Yep, you let it slip ... and I did ... I was now on two medications for Type II plus my two medications for my high BP still; I am heading in the wrong direction! 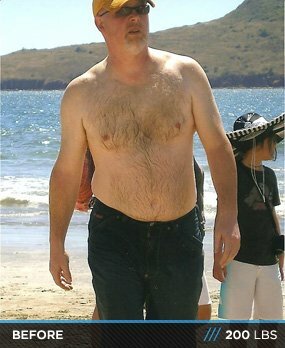 August 2008, I changed jobs, hopefully to reduce stress; I also vowed to start getting in shape. I wasn't too bad off I thought, but the basketball I was hiding under my shirt said otherwise! I noticed that when I played sports I was getting slower and less athletic than I was used to. I was frustrated that I couldn't keep up with the younger guys anymore, a big hit to my ego. I struggled with my dedication and motivation, my workouts lacked intensity and direction … I was "spinning my wheels" I felt. In November 2009 I joined the gym I still belong to, Ithinkfit Gym. I hadn't really lifted weights since high school (1979). Believe me, I was in for a shock at just how weak I had become! It was time to set aside my ego and put in some work! "Trust the process Greg …" was said to me often by Owner/Trainer Sean Harley. I started slow; Ithinkfit Gym offered a classic lifting class three nights per week. I did not miss one class; I had to re-learn how to lift, asking questions of the trainers, checking for proper form and getting loads of encouragement and advice. Mid January 2010 and 10 weeks after beginning it was time for routine blood work. Not only had my doctor noticed more tone, but less fat around my belly! After my lab work came back it was awesome news and I was put on 1/2 dosages of my Type II meds! And no appointment for six months. I had found the secret; by adding lean muscle and tweaking my diet I was now reversing the trend. In August of 2010 I was taken completely off those medications. NO SMALL FEAT! 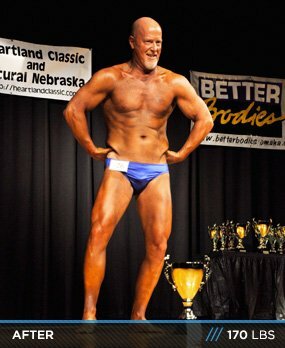 I stayed with the class until December 2010; continuing to add muscle, and dropping fat. I had to make a decision now, stay the course or step it up and see what this now 50-year-old grandfather could do! I asked gym owner/trainer Sean Harley if we would take me on as a personal client for 1-on-1 training. 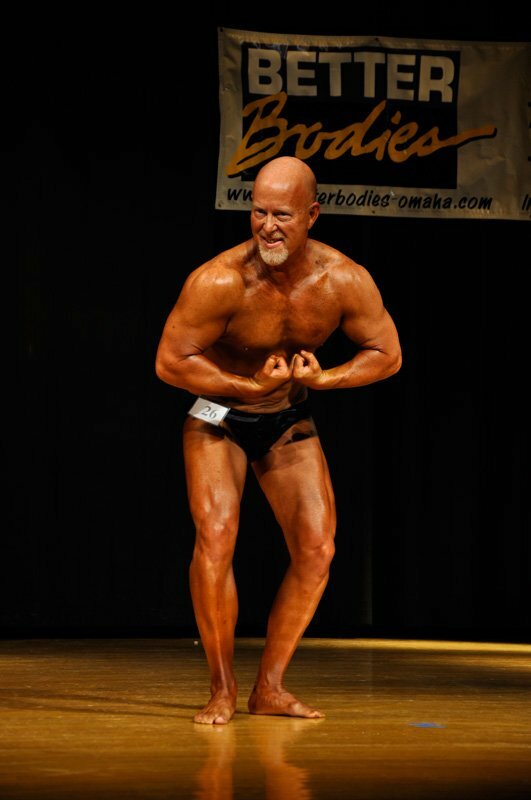 In mid January of 2011, ten weeks after starting the stepped up program and one year after my medications being halved I am informed that in June I would be competing in men's bodybuilding. Would I be ready? "We'll get you there… trust the process" I was told. The results of the two shows I did are listed down below. 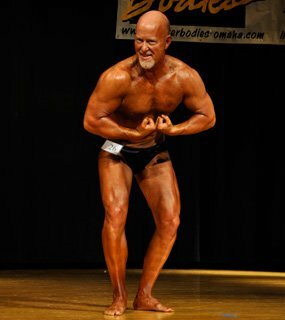 I have so far to go yet, but just showing up to a competition and competing with the other "cool old dudes" I felt like a WINNER no matter the placement. This is my diet for Leg or Back day*. I use a food diary tracker; Calorie Counter by FatSecret.com for tracking diet. *On days I work chest, carbs are reduced to 60g-80g; the other days/wk carbs are greater than 20g. Below is a typical lifting schedule for the week. In addition, I will work in abs once or twice a week as well as HIIT cardio at the end of some days such as with chest. No cardio on Thursday at all. The number of sets/reps vary from week to week, some weeks are 4 sets of 10-12 reps per set, other weeks are at 3 sets at 8 reps per. Also each week I try to vary the exercise for the group I am working on. I also vary sets by adding "drop sets" or "supersets" to the routine. My office is just off of a walk/bike trail, so weather permitting I am out there over my lunch hour getting in some "Zone 2" cardio. I track everything, whether that be an hour or more of lifting, HIIT cardio or a stroll outside. If I'm working, I'm tracking. I use a HR belt and an iPhone app to track my HR, Zone work, etc. 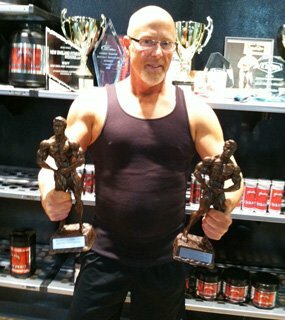 The fact you are reading my story on Bodybuilding.com means you are already on your way to a healthier you. I would urge you to pass this story along to your parents and yes, even your grandparents who may feel that this endeavor is for the young. Get a plan and follow it. Hire a trainer to push you beyond your limits. I didn't give up and buy bigger pants … neither should you! I have caught the bug it seems! I am looking at three shows in 2012. Gym: I Think Fit Gym, Omaha NE.